The name and décor of this elegant room conjure up images of romantic destinations! 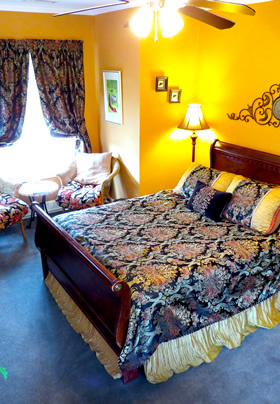 It features a oversized corner Jacuzzi tub for two in the bedroom, a queen-sized mahogany sleigh bed, and a sitting area for two, all surrounded by walls painted in rich, warm, luxurious colors. 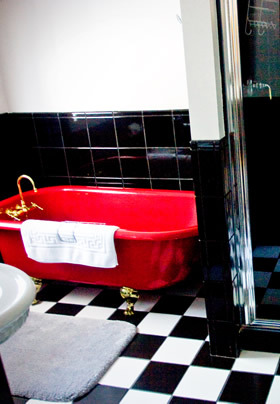 The black-and-white tile motif in the bathroom creates a background that lends visual drama to the red claw-foot tub, perfect for a long, hot soak. If the tub doesn’t appeal, the walk-in shower custom-built in black tile will fill the bill. Look out the windows and see a gorgeous view of the gazebo, the pool and the ponds!